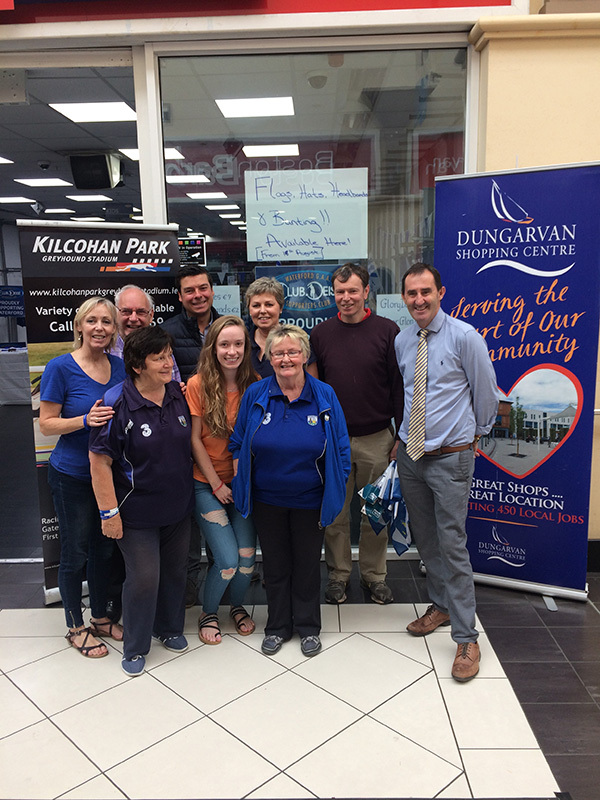 Club Deise pop up shop opened in Dungarvan Shopping Centre in aid of the Waterford Hurlers Training Fund which is sponsored by Dungarvan Shopping Centre from now until September 2nd. Club Deise members will be on hand selling banners, car flags, bunting and all things blue and white to support Derek McGrath and his team. There will also be tickets on sale for the wonderful prize of a chauffeured limousine to Dublin, two tickets to the All Ireland final including overnight accommodation in the Burlington Hotel as well as tickets to the Waterford Hurlers banquet on Sunday night. This fantastic prize and tickets will be on sale at Dungarvan Shopping Centre until August 30th at Unit 23, courtesy of Dungarvan Shopping Centre – proud to support local! Such was the demand for the blue and white colours that the shop ran out of stock on Saturday afternoon and had to re-order more in time for the reopening on Monday morning!